Have you ever wondered how birds fly or what's inside an egg? You can find out the answers to these questions and more in Everything You Need to Know About Birds. From nocturnal owls to flightless penguins, learn about the different evolution and habitats of birds from around the world. Discover how almost everything about a bird's anatomy is designed for flight, yet how its skeleton is also similar to that of a human. See how golden eagles are used for fox hunting in Kazakhstan, and try to find the differences and similarities between an ostrich and the dinosaur Eoraptor. A fact-filled, highly visual guide to different types of birds all across the world, Everything You Need to Know About Birds is packed with information on habitats, breeding habits, oddities, shocking trivia, and anatomy. Read about the different types of birds that hunt, dive, swim, run, and dig, including vultures, crows, parrots, chickens, and more. 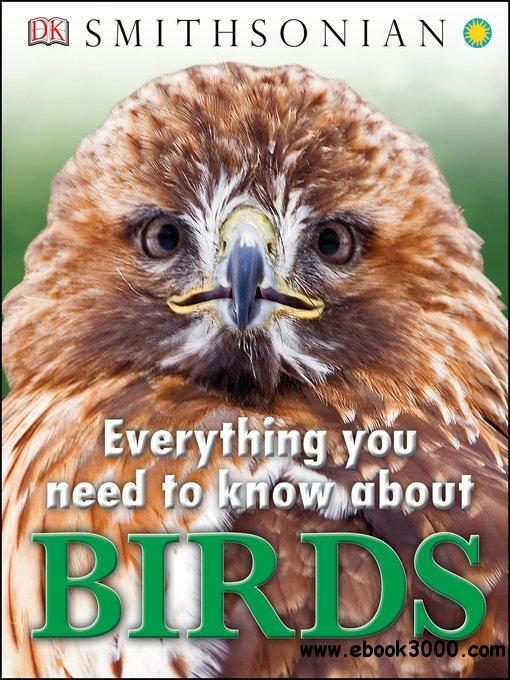 With close-ups, engaging text, and innovative, high-quality design, Everything You Need to Know About Birds is perfect for in-depth research or a quick dip for fast facts on these amazing creatures. Everything You Need to Know About Birds is dedicated to Jim Cutting and the Lincoln Akerman School fourth-grade class of 2015. DK Senior Editor Shannon Beatty said, "We felt that Mr. Cutting and his fourth-grade class of 2015 deserved some recognition for all their hard work to make the red-tailed hawk the official New Hampshire state raptor. Inspired by their story, we've dedicated our new book to them, and put the red-tailed hawk on the cover."